Construction on the nine remaining holes is expected to end around summer of this year; Vidanta Golf launched special rates to promote its golf courses. 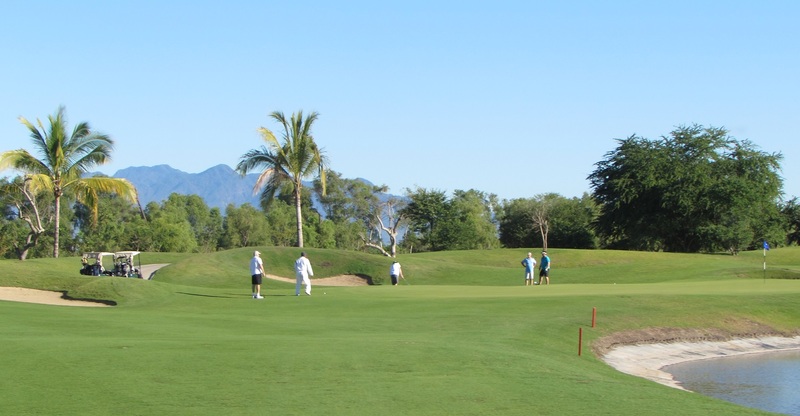 The first nine holes in the new Greg Norman in Vidanta Nuevo Vallarta are open for play to tourists, visitors and residents of the Riviera Nayarit, who can now enjoy a game to preview the course. The new golf course is located just across the Ameca River inside the Vidanta complex. The course is still under construction and it’s expected to be complete this summer. Once it’s finished it will host an inaugural tournament. With this new course Vidanta unites two of the world’s top names in golf course design—Jack Nicklaus and Greg Norman—each bringing their own unique construction characteristics. Tom Stickney, director of the Vidanta Golf Academy, said that both courses would have certain differences among them, each with features peculiar to their designers. According to Stickney, the Greg Norman courses usually increase in difficulty the closer you are to the hole, while those designed by Jack Nicklaus tend to swing left to right with more undulations, to mention just a few outstanding characteristics. Players will have a view of the Sierra Madre from the Greg Norman Golf Course and will be able to enjoy birds, crocodiles, trees, water canals and the lush nature surrounding the greens. The courses are available from 3 p.m. on via different promotional packages: the special rate for play on the Jack Nicklaus Course is $79 USD; it’s $125 for a round on the Greg Norman Course. This promotion includes golf club rentals.